Website optimization follows the same principles used in conversion rate optimization and is based on the scientific method. Determine the objective of your website optimization. Different business types will have different objectives you will want to optimize for. For example, if you ran an eCommerce website, you’d want to figure out how to increase purchases and average order values (AOV). To do this, a website owner will conduct quantitative and qualitative research on key pages of the website that affect the ultimate goal of the site. For instance, the homepage is often a valuable area to conduct A/B tests, since much of the website’s traffic arrives on this page first. It is important that visitors immediately understand what the company offers, and that they can find their way to the second step (a click). Come up with your best guesses on how to impact your objective. After identifying the top-level goal to improve, you should identify under-performing points on a web page and begins to formulate a hypothesis for how these elements could be tested to improve conversion rates. Create a list of variables that your experiment will test. 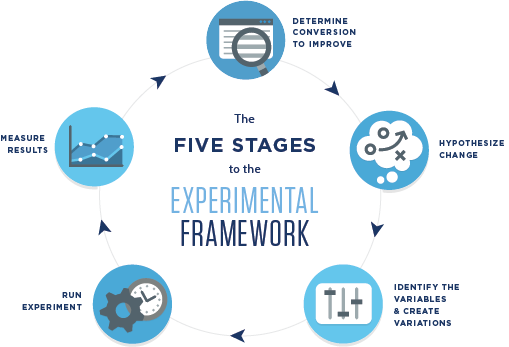 Changes can be created in variations and run as experiments in an A/B split testing tool. Run the experiment. Make sure when you’re running the experiment that you gather enough data to make your conclusions statistically significant. You don’t want to base your business decisions on inconclusive data sets. Measure the results, draw conclusions and then iterate. The results of an experiment will show whether or not the changes to the website element produced an improvement. A winning variation can become the new baseline, and tested iteratively as more ideas for improvement are generated. A losing test is still a valuable learning opportunity, and can provide direction on what to try next in the optimization process. Website optimization can offer many measurable business benefits if done correctly. First, the process of website optimization determines the best version of web page elements that help visitors to accomplish a certain goal. Optimization improves the efficiency of the website at converting visitor traffic into email subscribers, readers, or paying customers. In turn, improved efficiency leads to greater ROI on customer acquisition and traffic-generating campaigns such as web searches, Google AdWords, social media, and email marketing. The goals of a website will vary depending upon the type of business, the business’ target customers, and the desired action of that audience: a purchase, filling out a form, or reading an article. The desired action of a website visitor can also be <b>conversions</b>, or the number of audience members who complete a certain action. An online publication practices website optimization with the conversion goal of increasing the number of articles visitors read. An online store optimizes its website to encourage completion of checkouts and repeat purchases. An online software company optimizes its website to improve the rate at which visitors sign up for (or convert to) a free trial of the product. An insurance company optimizes its website to capture more potential leads for insurance coverage sales. A fundraising campaign optimizes their donation form to encourage more donations. A headline, or key messages related to the company’s value proposition. The use of visual media, like photography or a video. The length of a form, varying the number of required fields or the order of completion. The prominent display of customer case studies that describes their success using your product or service. The visual style, text, and placement of a call to action (CTA) button or link. The organization of the website’s navigation. The placement of social sharing functionality. The appearance and organization of the webpage for a visitor on a mobile device. Landing pages for marketing campaigns are also often an area of a website that can be optimized, because of the high-quality traffic that is being sent there by ads, email, or social media. Website owners can also conduct website optimization on multi-page processes on their websites, like a free trial signup, a checkout funnel, or any multi-page form. Website optimization is also sometimes used to describe the practice of improving the discoverability of a website for search engines, with the ultimate goal of improving search result rankings for key search terms. The key ranking factors to consider when doing search engine optimization (SEO) include: changing page titles, decreasing page load speeds, minimizing poor user experience, using the right keywords, and producing well-written content. Changing page titles – search engines like Google use your <title> tag to understand what your page is about and serve that content to its users. Make sure your <title> tag is less than 160 characters, unique to the page, and click worthy. Decreasing page load speeds – website optimization can also be connected to improving the site speed and site performance. This is implicitly relevant to the goal of website optimization as the completion of a desired action on a website. Poor website performance, such as latency or slow page speeds, can prohibit visitors from taking action due to an inability to navigate the website. Minimizing poor user experience – Google’s latest algorithm updates reveal that user engagement metrics like dwell time–how long someone stays on your website from the Google search engine results page–are being used for rankings. If users are staying longer on your site compared to your competitors, you will see higher rankings. Using the right keywords – the core of SEO still depends on the usage of relevant keywords. For example, say you run a sushi restaurant. Does it make sense to have a page that is going after the keyword [Japanese delivery] or [sushi delivery]? Based on keyword research in the US, we can see that there’s 1,900 searches for [Japanese delivery] and 18,100 searches for [sushi delivery]. Producing well-written content – at the end of the day, search engines are serving users the best content they can find. If Google directs one of its users to your content and it’s full of grammar and spelling mistakes, then that reflects poorly on Google. Make sure the content you’re crafting is unique, full of value and well-written.